QoR (pronounced core) watercolors feature an advanced archival, water-soluble binder, Aquazol, that supports greater pigment loading than traditional watercolor binders. 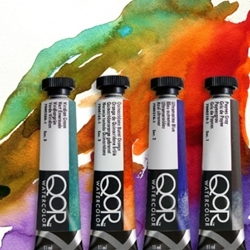 This allows QoR watercolors to provide more pigment strength and vivid depth of color in every brushstroke, while retaining the best qualities of traditional watercolors. The binder is used within the conservation community for painting restoration, and is more flexible and less brittle than traditional watercolor binders, offering improved flexibility and adhesion. The vibrant, intense colors flow well, produce incredibly smooth transitions and stay brilliant even after they dry. They also have excellent re-solubility in water and have great glazing qualities. Available in 11ml tubes.